In 1971, three men specialising in textiles decided to exploit a new fashion trend: trousers for women. Very quickly, the product range broadened, to include the whole range of ready to wear women's clothes, targeting young women aged between 15 and 25. Against this backdrop, the first Pimckie shop was opened in one of the main shopping streets in Lille. The name "Pimckie" comes from a brand of shoe with an innovative and young look. The shoe was never sold, but a name had been born! The 80s and 90s: 100 shops in France and the beginning of our expansion into the rest of Europe! In 1983, Pimckie became ... Pimkie - lighter and more feminine. Gradually, Pimkie opened shops throughout the whole of France and by the end of the 1980s, there were a hundred shops. Encouraged by the success in France, we decided to take the brand to customers outside our own borders. In 1988, we opened the first shop in Germany, in Heidelberg. In 1990, we opened the first shop in Spain, in Seville. In 1994, we opened the first shop in Italy, in Turin. In 1998, Pimkie had 429 shops in 9 countries. 2000 onwards : Pimkie continued to develop and launched its website! By that time, Pimkie had 699 shops in 17 countries. In 2007, Pimkie started to expand in the Middle East and Eastern Europe. In 2009, the Pimkie brand affirmed its marketing statement: to be the preferred brand of young 20 years old European women and stated its values. Pimkie is addressing "real girls". 2011: Pimkie, a brand looking resolutely to the future! 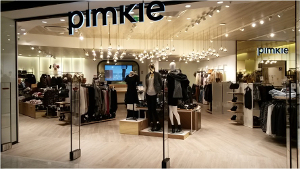 Pimkie can now boldly state that it is an international brand with 756 shops in 26 countries. On the web, the brand has also just started to launch Spanish and Italian shopping sites.